C F A Voysey, attributed. 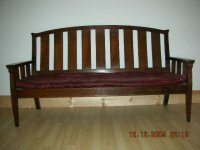 A superb quality Arts and Crafts long and narrow hall or library table made from wonderful quarter sawn oak. The tapering legs with turned balls as feet which are turned from the leg and an integral part of the design. 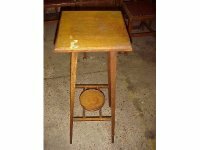 The quality and style of this table make it a firm attributation to Voysey who used integrated ball feet on a number of designs. 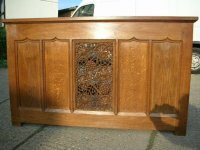 A Gothic Revival oak serving table with finely carved centre panel of Vines attributed to Arthur Simpson of Kendal. Height 36", Width 60", Depth 23 1/2". Circa 1880. 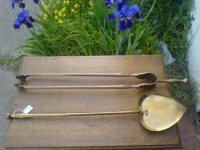 Charles Francis Annesley Voysey for Thomas Elsley, Heart shaped coal shovel and a matching tongs, note the subtle shapes to the handles and the subtle shape to the tongs just where ones hand would be, with three cold rivets where the sprung part meets each tong, a pleasure to hold. See Gilbert, Christopher ‘Furniture at Temple Newsam House and Lotherton Hall’, vol 1, p. 145, no. 172 An example exhibited in the Arts and Crafts Society Exhibition, 1902. C.F.A.Voysey. 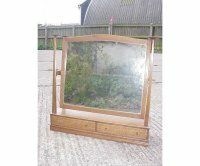 A rare and important dressing table mirror designed by Voysey and made by Arthur Simpson of Kendal. 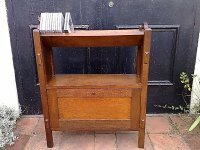 A superb quality little Arts and Crafts oak bookcase with upper angular gulley perfect for CD's and DVD's or books with a shelf below and a cupboard to the base. In the manner of Arthur Simpson. Height 30 1/2", Length 24 1/2", Depth 8 1/2". Circa 1895. An imaginatively designed superior quality 1/4 sawn oak Arts and Crafts sideboard made by Arthur W Simpson of Kendal one of the most important Master Craftsman from the Arts and Crafts Movement, a leading carver and designer of domestic and ecclesiastical furniture at the end of the nineteenth and beginning of the 20th century..
Arthur Simpson of Kendal (attributed)., a rare Arts and Crafts hatstand with a copper lantern to the top, copper coat hooks below the lantern and umbrella/walking stick retainers lower down with hand formed copper drip trays to the base. This was purchased in the Lake district. 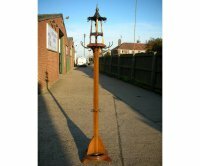 Height 89", Width at the base which is the widest point 19". 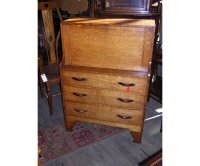 An Arts and Crafts cabinet/linen press by Arthur Simpson of Kendal with cupboard to the top and two drawers below with sculptured Cuban Mahogany handles. Makers disc label to the back. 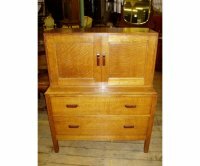 An Arts and Crafts oak bureau by Arthur Simpson of Kendal, with leather writing area and a fitted interior, the three drawers with sculptured Bog Oak handles, numbered 9408 to the back. Height 30", Depth 17", Width 42". C1910. Arthur Simpson. 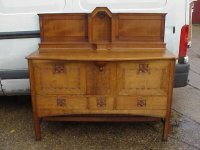 A rare Arts and Crafts oak settle with Voysey influenced heart details. An exceptional quality Arts and Crafts corner cupboard attributed to Arthur Simpson of Kendal with stylised floral carving to the top rail, a single door below and the whole stood on turned legs. 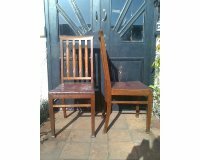 A pair of Arts and Crafts oak chairs by Arthur Simpson of Kendal with line and dot inlaid decoration. 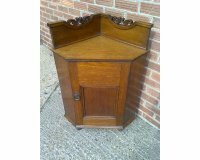 A rare pair of C F A Voysey plant stands, See Good Citizens Furniture, The Arts and Crafts Collection at Cheltenham Museum by Annette Carruthers and Mary Greenstead. ISBN 0 85331 650 3. Where this plant stand is illustrated. 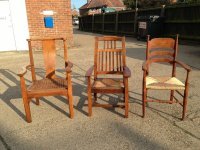 A very stylish set of four Arts and Crafts oak tri-pod chairs of very interesting design attributed to Arthur Simpson of Kendal with stylised handles to the back and shaped seat all with exposed joints. There is an image of an almost identical chair in The Simpsons Of Kendal book. Arthur Simpson Of Kendall. A very good Arts and Crafts oak dining table with sweeping stretchers and subtle carved details to the legs. The quality of this dining is exceptional like all the furniture produced at The Handicrafts, with original label underneath. Length 6'6", Height 29", Width 36". Circa 1900. An AWS Simpson armchair with shaped back and original ratten drop in seat with another rush seated armchair. Both SOLD. RIGHT. An armchair by William Birch with three shaped ladder back splats. Fully restored. 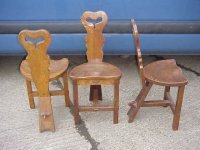 There are also a pair of matching sidechairs which have also been restored. Arthur Simpson. 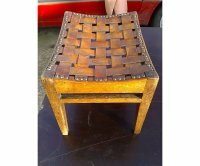 An oak Arts and Crafts stool with inset studded woven leather seat. Circa 1900. An iconic Arts and Crafts oak three fold screen the design attributed to CFA Voysey, probably executed by Liberty and Co at the Wyburd studios. The tops of the screen with moulded details. 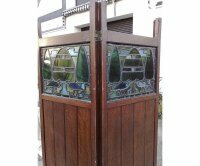 The stain glass with probably the most famous Voysey design of two birds kissing in front of three trees. Height 75", Width of each screen 21 1/2", Width 64 1/2", Thickness of each panel 1 1/4". Circa 1890. Arthur Simpson of Kendal. 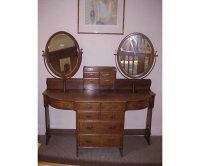 One of the nicest most unusual oak Arts and Crafts dressing tables I have ever come across. Designed for lovers to share. Width 71" Depth 23" Height 62". Circa 1890.